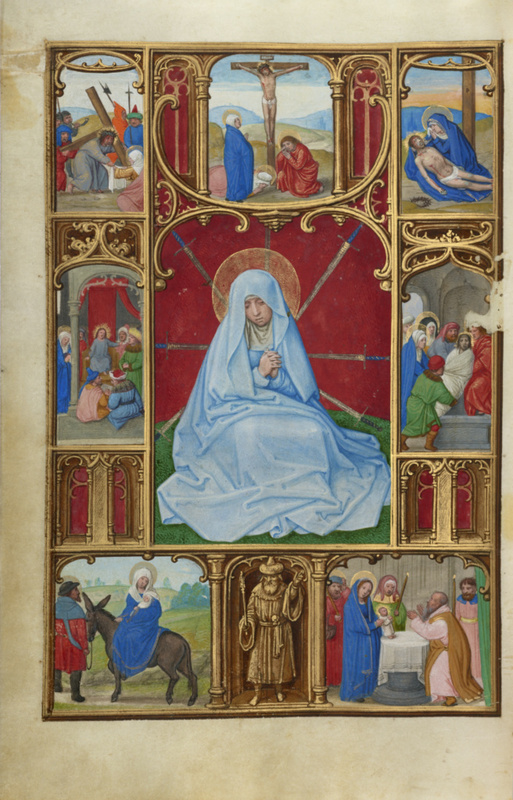 In the center of the miniature, the Virgin sits on the ground with seven swords piercing her, each symbolizing one of the events related to Christ that brought her sorrow. The theme of the Seven Sorrows of the Virgin was meant to draw the viewer into Mary's thoughts and feelings as she reflected on her son's life and death. Moving clockwise from the bottom right around the central image, small narrative scenes represent the seven episodes: the Presentation in the Temple, the Flight into Egypt, the Dispute in the Temple, the Way to Calvary, the Crucifixion, the Lamentation, and the Entombment.